Modern ocean liners in their characteristics differ from those of sailing ships that plied the sea a few centuries ago. It would seem that current technology needs to ensure the ships a high survivability and floodability. However, and now ships from time to time sink. The causes of Maritime disasters can be very different. Modern vessels equipped with the most advanced navigation systems. The materials from which made the hull of ships, high durability, resistance to wear and damage. But from time to time in the press the sad reports of the death ships. This trouble happened on the sea many centuries ago, it is impossible to exclude completely a Maritime disaster and in the twenty-first century. The most common cause of what is happening with vehicles accidents is the neglect of the crew to the rules of navigation. Experienced sailors know that the safest place for a ship – wise. In the sea or the ocean, the ship always lurk many troubles. Especially dangerous swimming near the coastal strip. Here are the most common strong currents, shoals and rocks that can damage the ship. Indeed, very often the ship gets fatal damage when at full speed bumps into the obstacle. The hull skin strong enough but it has a tensile strength. If the ship got a serious hole in the hold begins to enter the water that fills the compartments. For this reason, the ship becomes unstable and may tip over. To reduce the likelihood of flooding, the internal space of modern ships try to divide into sealed compartments within which a set of powerful pumps, able to pump out water. Worst of all, when the hole is so large that the pump cannot handle the load. A large hole in the hull to seal in the sea almost impossible. The crew's only hope for rescue funds. Any vehicle designed so that it had a certain amount of strength and buoyancy. If the damaged ship is in the oceans under conditions of strong emotion or even a real storm, chances are that the ship will remain afloat, are reduced. In conditions of high waves, some ships have a long and narrow body, it can break in half. The result is the imminent immersion of the ship into the water. Another reason of the sinking of the ship is placed incorrectly and carelessly secured load. During the storm the contents of the hold may well move in the direction that often leads to a strong roll. 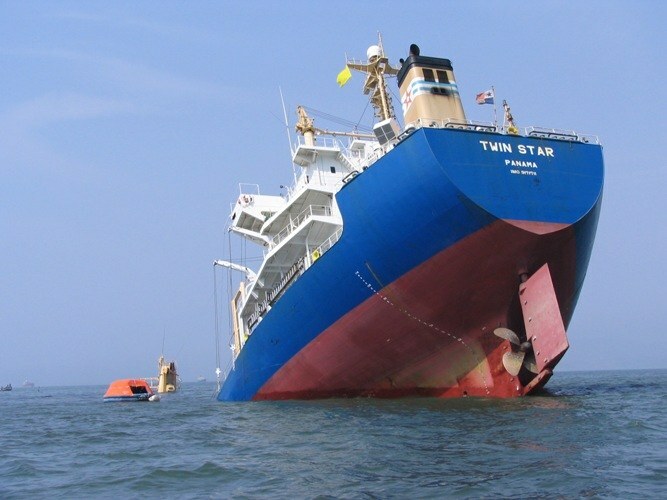 If the load on one side is critical, the ship can tip over sideways and even turn upside down, then the ship can go down. Fully guarantee the safety of the ship through the waterways impossible. But you can reduce the possibility of tragedy, if strictly follow all the rules of operation of vessels developed by many generations of seafarers, and with the utmost attention to changing conditions, which is swimming.